The rock may look solid but is the Jewelry beyond Jewelry repair? Knowing when to say "No" to a piece of Antique Jewelry, Premier Jewelry or Pearl Jewelry can sometimes be harder than saying "Invest Now" especially if you are new to this area of investing and uncertain how to invest money in Antique Jewelry, Premier Jewelry and Pearls. The art of knowing when to decline an item that's beyond fine jewellery repair, depends on a number of things, and one of the most important, is your ability to detect any significant repairs, and then knowing the effect these repairs will have on the jewelry's market value. 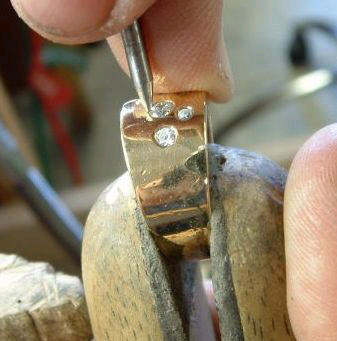 Many Jewellery repairs are extremely well executed by reputable jewellers experienced in handling antique jewelry and have saved the life of the jewel for the enjoyment of future generations, while other fast fix jewelry repairs, are well...not so good, to put it mildly. Examine the piece with your Jewelers Loupe. Inspect for seams and solder joins which appear as a different color to the main material. Examine the back of the jewelry as well as the front. If you find a seam it will indicate that the piece has been previously repaired or had a previous life as part of a larger work. Examine the clasps on the back of brooches, pin brooches and bracelets. Are they working? Damaged? Been repaired? Different styles of clasps indicate different age dates determined by the design and technique that were being used at the time. For instance, the "trombone-style" Clasp that you can just make out, on the back of this beautiful old mine cut diamond brooch, sent in by a visitor on Antique Jewelry Investor dates to the turn of the century. Buying over the internet, while it has its' own set of distinct advantages, demands new standards of identification, invest tools and examination tools. This applies just as much to Cultured Pearls, where it's extremely difficult to trust the validity of the photograph. Scrutinize all the photos carefully from the front and sides. I use a magnifying glass to examine photographs when buying jewelry on-line, with loupe magnification of 15x. Make sure the jeweler's loupe has a 10x fully corrected lens. A Fully Corrected lens means it will magnify the item 10 times and is fully corrected for depth distortion and color perception. If you are buying on-line and there isn't a photo of the back of the jewelry, contact the seller and ask if they wouldn't mind uploading another photograph of the back of the jewelry. Most dealers won't mind and if they do, shop elsewhere. The great appeal of Antique jewelry is often the patina, especially I find with Antique & Vintage Silver items, which only age can impart. A certain amount of wear is quite acceptable for Antique & Vintage Jewelry, in fact, it's desirable. Consider designing your own engagement ring from heirloom jewelry, using the Antique Diamonds or the antique ring setting itself. Check to determine how much wearing down of the metal on the back of the Antique Wedding Rings. Finally, if you have jewelry and you consider the repairs and/or the damage is less than acceptable, ask your local jeweler that you can trust for their opinion, before you sell it for the scrap value. Rhinestone Costume jewelry repair is a specialized area. To locate a jeweler experienced in repairing Antique jewelry, one of the simplest ways is by contacting us as we have a worldwide data base of reputable jewellers experienced in fine antique & vintage jewellery. How to invest money safely in Antique jewelry basically all boils down to the amount of knowledge that you have about Antique jewelry, repairs jobs and your understanding of that particular style in jewelry art history. Bell, J., How to be a Jewelry Detective, A.D. Publishing, Kansas, 2002. Jeanenne Bell's Book is Available from the Antique Jewelry Investor Library.